This is how excited a GS makes us. Well, some of us. Well, Chris. It’s too slow – The outgoing 1200GS had plenty of low-down shove, granted, but it was a little asthmatic when you wanted to get a wriggle on down a fast (3rd-gear upwards) road. Well, the new one might not have the frankly ridiculous speed of a Multistrada or KTM 1190 Adventure, but it is now fast enough to keep them in sight. Until speeds creep over 110 mph, it’s got plenty of shove to maintain a manic grin. The crank reaction makes me fall over – Always a giggle this; one of the quirks of a longitudinally mounted motor (the crankshaft running front to back, rather than across the frame like most bikes) is a healthy torque reaction when you blip the throttle. In other words, as you rev the bike, it tries to fall over to the right. On the old bike, if you weren’t expecting it and perhaps had just your left foot on the ground, it could catch you out. The new engine with its lighter crankshaft still does it, but nowhere near as much. You could blame dropping the bike on it, but we’ll all know you’re lying, shortarse. The gearbox is full of neutrals – A production error on the old GS, lead to every bike being fitted with extra neutrals that would occasionally crop up between gears, normally 5th and 6th. 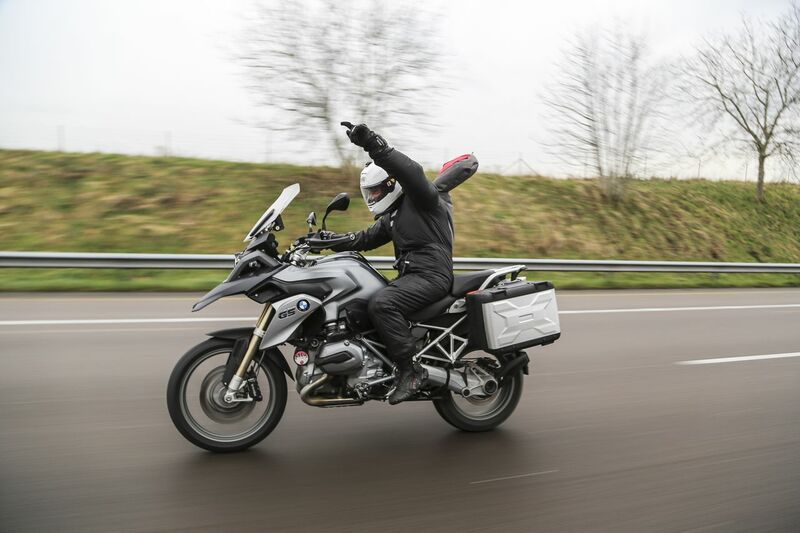 Realizing how much extra this was costing them per bike, BMW have reduced the number of neutrals in the new ‘box to just one, between first and second. Apparently, most riders prefer fewer neutrals anyway. The traction control and ABS came out the ark with Noah – The old bike’s traction control and ABS was adequate for keeping you out of trouble, that’s about it. And the way the TC cut the power was no more intrusive than, say, an angry gorilla prising open your visor, climbing into your crash helmet and trying to ram a banana up your nose. Thankfully the new stuff is brilliant, and even works well in the off road modes. The TC keeps you safe without annoying you until you want to pull a massive wheelie. But then you just turn it off with one button on the left handlebar, even if you’re moving along. Braaap. I don’t like Telelever suspension – Well, there’s just no pleasing some people is there? The new GS keeps the Telelever system, with all the benefits and disadvantages it brings. On the road, I’m a fan of the way it keeps the bike stable and level whatever you get up to on the brakes. On the track it’s the skinny tyres that bother me long before the suspension does. Off road, I’ll concede that I do prefer a telescopic fork and no shaft drive when riding hard, but ask yourself this – how often are you going to hammer your £12k bike around an enduro track? Give the nice people at your local BMW dealer a ring and try one for yourself, don’t be shy, you might just like it.